Create NSW spoke to Lily Shearer about her work as a freelancer, a cultural collaborator and what’s coming up for Moogahlin Performing Arts. You are a freelance-performing artist, cultural collaborator, consultant, educator and member of the Moogahlin Artistic Directorate. What do you enjoy most about these different roles? These days most of my time is spent as one of three co-artistic directors of Moogahlin Performing Arts. I really enjoy the cross-hatching and weaving of my roles and responsibilities, sharing my experiences and skills, throughout all my projects. This enables me to build my networks and relationships to be a player in the arts ecology, ensuring growth for a strong and healthy landscape of First Peoples artists, arts workers and communities sharing stories through the performing arts. These can vary depending on place, people and artforms, in context with the project, to celebrate through ceremony and performance. You are the co-artistic director of Moogahlin Performing Arts and you have been there since it was established in 2007. How have you seen the organisation develop over that time? Moogahlin has grown from a concept to a reality since forming over ten years ago, working project to project until receiving the Australia Council for the Arts four-year funding in 2017. Moogahlin operates in partnership with arts companies, community organisations and local government agencies to deliver our core program of developing and commissioning new work, presenting new work, and regional projects. We are a resident company at Carriageworks Redfern, and a company in residence at Blacktown Arts, Blacktown City Council. Respect – We respect the diversity of First Peoples’ experiences, languages, land, water, air, practices, and lore. Responsibility – we are placing ourselves in a leadership role and have a responsibility to create opportunities, give voice to those who don’t have voice, create culturally safe spaces, and to contribute to legacy of intergenerational relationships around storytelling and knowledge sharing. Relationships – our approach is heavily based on building relationships through our strategic partnership model. We understand that sustainable partnerships require trust, time and patience – whether they be with individual artists, with communities, with other arts organisations around the continent, or with First Peoples from other countries. Reciprocity – we create cultural arts exchange opportunities with community & artists locally, nationally, and internationally. It is always about the collective benefit of all involved. 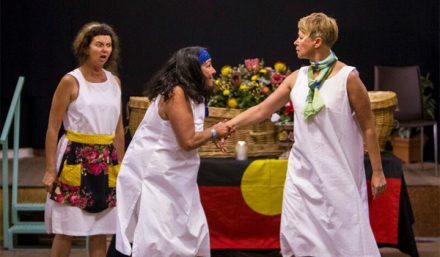 Relevance – we engage in critical discourse from a First Peoples’ worldview, seeking community feedback on our work and asking community to be engaged in all levels of creation. Moogahlin aims to create and tell community-based stories, develop a comprehensive youth theatre and produce distinctive, cross-cultural and interdisciplinary performance works. What do you feel telling community stories in this way is effective? This process of sharing community-based stories from Elders, Youth and artists collaborations validates the lived experience of our First Peoples in a global context. Coupled with the diversity of our knowledges, the opportunity to celebrate difference and the constant exchange of learning is a healing journey for us and our people. It contributes to the cannon of First Peoples’ stories in the creative industries, following the trajectory that our foremothers and forefather began for us. It’s an honour and privilege to walk together with communities to facilitate a shared vision through performing arts practices, not one way of telling stories but a smorgasbord. Can you share with us a few events that Moogahlin are working on this year? Baiame’s Ngunnhu Festival in Brewarrina NSW with the Cultural Museum and local Shire Council. Masterclass at Carriageworks in October. What does National Reconciliation Week mean to you and how will you be observing it this year? National Reconciliation Week reminds me that our country needs to conciliate with its First Peoples, as they did nothing wrong to begin with. I will observe this annual event by reflecting on my role in this conversation, and that I don’t have to continually justify my existence as a Murrawarri citizen. I will go about my normal day, remind people that ‘Sorry Day’, ‘The Apology’ and ‘Reconciliation’ are all government directives and are all very different events and dates, as again I believe the leaders of our country mislead its constituents to believe it’s all the same. I plan to attend Moogahlin’s AGM on “Sorry Day” and celebrate our milestones and achievements with Moogahlin Players (Members). To find out more subscribe to Moogahlin through our website: www.moogahlin.org. Like Moogahlin on Facebook, Instagram or follow us on Twitter.